As Mrs C is an Ophthalmologist (with a sub-sub-sub speciality interest in a structure that as far as I can make out you can’t see or feel) it does mean that a rather large number of eye journals come to the door of Carley Towers. I try to keep a passing interest in picking anything up that might cross the boundaries of our specialities, but in all honesty it’s quite rare. Emergency Ophthalmology doesn’t seem to feature much in the eye journals which is a surprise considering the number of patients we see with acute eye problems. However, that’s a whinge for another day because this month the American Academy of Ophthalmology has published a case series of ocular injuries sustained at the Marathon bombing in Boston Massachusetts, and during a fertiliser plant explosion in Texas 2 days later. As ever, the abstract is below, but ideally read the full paper. 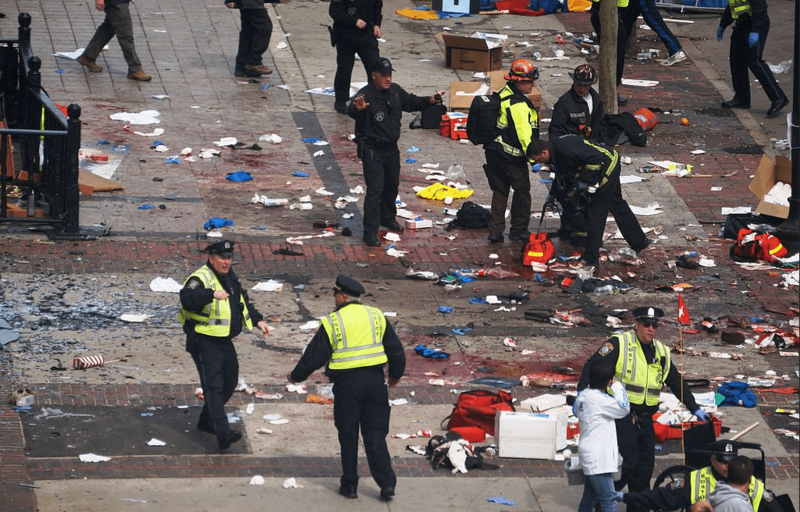 I will presume that readers are familiar with the bombing that took place near the finishing line of the Boston Marathon in 2013. This tragic event left 3 dead at the scene and 264 injured runners and spectators from two homemade devices. 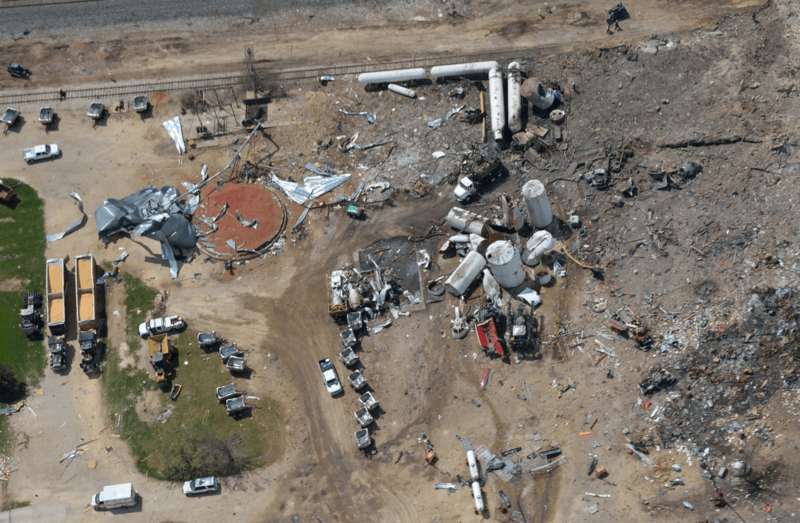 The fertiliser explosion in Texas killed 15 and injured 263. The authors have written this paper to describe the large number of ocular injuries sustained in these blasts and in that regard there are lessons for civilian and military incident planners. Well, as this is an Ophthalmology journal the patients described are only those that required Ophthalmic consultation. ED only consultations were not recorded so there is a likelihood that the number and proportion of patients with ocular injury will be under estimated by this study. In Boston 22 (13.4% of the injured transported) required Ophthalmology consultation and in Texas 14 (6.4%) required consults. IN Boston most patients were seen either in theatre, on the wards or on the ICU. In part this may reflect a need to deal with life threatening injuries before sight threatening injuries and that’s understandable, but the potential morbidity from ocular trauma is tremendous. In West, Texas a greater proportion were seen in the ED, but many were seen later. In the majority ocular injuries were minor, such as chemises, epithelial erosions and singed lashes. However in 8 patients an open globe repair was required for intraocular foreign bodies. The lesson here is that ocular injury is part of the blast injury complex and we should actively look for it in these sorts of patients. What are the implications for EM, ICU and Ophthalmology? Military and previous civilian blast injury experience tells us that blast injuries frequently cause ocular injury and that we should plan for this. In the UK Ophthalmology is a small speciality that is not always co-located with emergency services and I suspect that this is the case in most other countries. As with any small speciality it requires relatively small numbers of patients to challenge capacity (as there is not that much capacity at any time and especially out of hours). These incidents demonstrate that some mechanisms of man made incidents may result in relatively large numbers of casualities with specific ophthalmological problems and consequently our colleagues must plan to achieve this. Some time ago I read a lot of major incident plans and at that time the role of the Ophthalmology teams was often to perform general duties in support of the hospital response. This paper and others suggests that their role may be more centre stage than in the wings and that we need to plan for that. Ophthalmology itself is divided into subspecialties and a range of these would be required to deal with the injuries in this study. Retinal, paediatric and corneal specialists would almost certainly be required and of course the number of individuals in sub specialities is even less with a concomitant decrease in capacity and availability. For our EM, ICU and other inpatient colleagues then it’s clear that the secondary and tertiary surveys of our trauma patients in blast injury requires a careful assessment of the eyes. Ideally this should be done soon after injury before oedema develops leading to a more difficult assessment. Don’t forget ultrasound as a method of assessing the ocular contents (courtesy of the awesome Matt and Mike from ultrasound podcast) in patients with extensive eyelid swelling, and in particular for the detection of intraocular foreign body, but be careful with applying any pressure to a potentially perforated eye (Mrs C tells me). Another excellent opportunity for examination is during anaesthesia for any patient unfortunate enough to require emergent operation. A paralysed, anaesthetised patient may be easier to examine (but get a visual acuity first). From personal experience I can safely say that you don’t want to wake a difficult to examine patient up to only then call the Ophthalmologist to come and examine the eye in theatre recovery or on the ward. Honestly, you really don’t want to do that. Reference 8 below is a review article on blast injuries to the eye and it’s worth a read. You can find it here on pubmed or this link at Cambridge journals should also work though it’s not #FOAMed. You should also have a look at this excellent presentation from Dr Root (my second favourite Ophthalmologist), thanks to Jo Deverill for finding this for us :-). In summary I would suggest the following from a clinical perspective. 1. 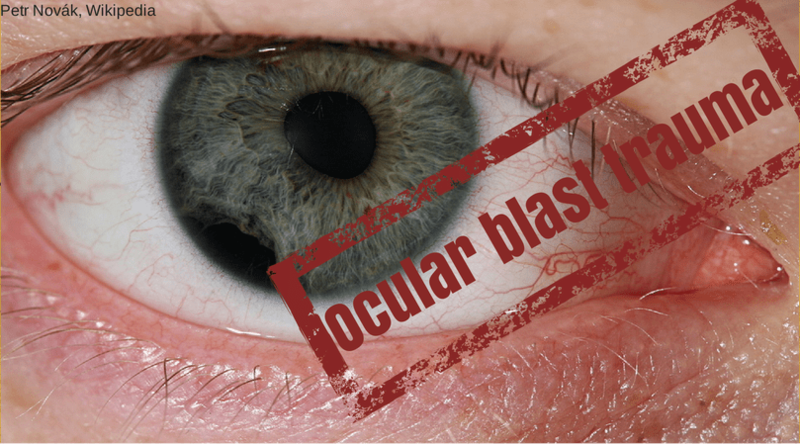 Expect and look for ocular injury in all blast patients. 2. If you suspect or identify ocular injury protect the eye. Do not put pressuer on any eye suspected of having globe perforation. 4. Obtain CT to determine the extent of ocular and associated injury if penetrating/associated injury suspected. (I think ocular USS could be used in patients unable to get to CT or in non-CT settings but that’s just my opinion). 7. Recognise that many ocular injuries may be missed on first assessment. Make sure that assessment is part of secondary and tertiary survey. Is this the best evidence there is? In brief, yes. It’s always going to be rather difficult to conduct trials of disaster plans and so much of the evidence available to clinicians and planners comes from case reports, case series and expert opinion. That’s not always the highest quality evidence in terms of methodology (as in this study) but it is often the best quality evidence available. We are unlikely to see an RCT of major incident/disaster response at any time in the future so for now, we can be grateful to those who write and share lessons learned such that we might all learn, plan and hope that we never need to respond. 1. Lessons from Boston Kellerman A. http://www.nejm.org/doi/full/10.1056/NEJMp1305304. 3. Prehosp Disaster Med. 2012 Aug;27(4):351-8. Epub 2012 Jul 19. An international expert Delphi study to determine research needs in major incident management. 7. Primary blast injuries to the eye: a review of the evidence. Abbotts R1, Harrison SE, Cooper GL. J R Army Med Corps. 2007 Jun;153(2):119-23. 8. Blast eye injuries: a review for first responders. Morley MG1, Nguyen JK, Heier JS, Shingleton BJ, Pasternak JF, Bower KS. Disaster Med Public Health Prep. 2010 Jun;4(2):154-60. Thanks Jo. That’s fab and I’ve included it above. Tim Root is a brilliant presenter. Perhaps he should be invited to speak at SMACCUS. There was a blast injury conference in London in the mid 1990s where one if our conclusions was that all blast injury patients should be reviewed by a ‘head and neck’ team before discharge due to a number of occult injuries from small fragment woulds that were initially missed and led to later re-presentation. It seems that this might be a good addition to our hospital major incident plans. Good thinking Tim. Presume the head and neck team would be Ophthalmology + ?ENT / ?MaxFax / Plastics ??? Sounds like a good idea to adopt.